chaeuffer driven van includes gasoline and driver van capacity : 10 departure anytime of the day from airport or from your hotel to your hotel in elnido Puerto to elnido this is one way transfer only Rate 1 van = Now on promo 180$ one way or 9500 pesos roundtrip 240$ roundtrip or 12000 You can also book roundtrip and get special rate for 2 way . 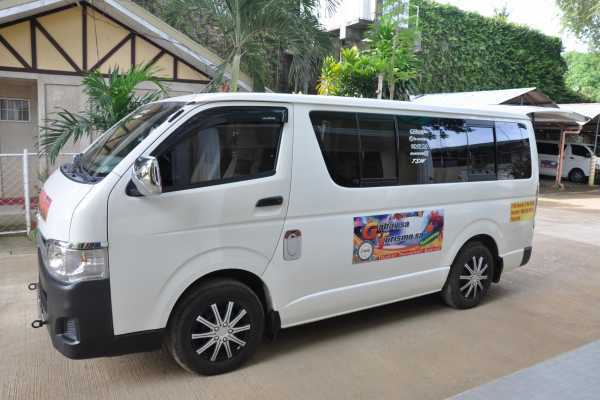 This is van Rental from Port barton to Puerto Princesa City This includes driver and gasoline 1-10 seater airconditioned van Please inform us the time & name of your hotel or pick up location. The rate is per van 1 van = $140 one way Get cheaper rate if you book roundtrip transfers. This is one way transfer from Puerto Princesa City going to elnido with gasoline and driver. If you are coming from Puerto Princesa International airport please inform us the time of your arrival for pick up. Van capacity is 1 - 10 persons. $ 180 One way trip. This is a van rental with driver and gasoline included. Route: From Puerto Princesa City to any hotel in port barton or in san vicente. Van capacity 1- 10 persons maximum The rate is per van $140 Airconditioned 10 seater van You may also book roundtrip at a discounted price.